Global vitreous tamponades market was valued at US$ 77.2 Mn in 2017 and expected to reach US$ 105.8 Mn by 2026, expanding at a CAGR of 3.5% from 2018 to 2026. 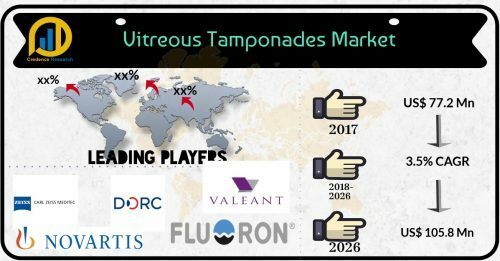 The latest market report published by Credence Research, Inc. "Vitreous Tamponades Market - Growth, Future Prospects, Competitive Analysis, 2018 - 2026," the global vitreous tamponades market was valued at US$ 77.2 million in 2017 and expected to reach US$ 105.8 million by 2026, expanding at a CAGR of 3.5 percent from 2018 to 2026. Vitreous tamponades are used for reattachment of the retina and treatment of other vitreous deformations in vitrectomy surgeries. These products are often used during retinal surgery and post-surgery recovery measures for the treatment of retinal disorders. Some common conditions in which vitreous tamponades are sued during treatment include retinitis pigmentosa, diabetic retinopathy, retinal degeneration, retinal detachment, macular hole, macular edema, retinopathy or prematurity, uveitis, vascular occlusion, and so on. Vitreous occupies the gap between the eye lens and the retina; and since it can not regenerate, this cavity needs to be replenished by surgery. Gas and liquid vitreous tamponades are the ideal choice during surgical interventions. Stable growth of the global vitreous tamponade market is driven by increasing incidence of retinal conditions such as diabetic retinopathy, retinal detachments, etc. The global incidence of diabetes is increasing, paving the way for increased patient pool for diabetic reinopathy, thus increasing demand for vitreous tamponades in vitrectomy. Continuing developments in the field of vitreoretinal surgery have also increased the need for suitable vitreous substitutes. An ideal substitute is expected to maintain all the natural vitreous' biochemical and physical characteristics. Furthermore, as new surgical techniques with smaller instruments have been introduced on the market with proven safety profiles, there has been a consistent increase in the number of patients opting for such surgeries. This also led to the use of more viscous vitreous substitutes. Growing incidence of vitreoretinal disorders and complications of diabetes such as diabetic retinopathy is a key driver of this market. These conditions are treated with vitrectomy involving removal of the vitreous humor along with replacement with synthetic substitute. In addition, increasing geriatric population is also considered as one of the prominent factors that have a positive impact on market growth. Based on the competitive scenario, this market is witnessing the presence of a limited number of players, who further enjoy regional dominance. 6.2. Dutch Ophthalmic Research Center (International) B.V.
6.4. Valeant Pharmaceuticals International, Inc.